The life of tyres depends on the pressure, driving style, and other circumstances. Following the advice below can extend the service life of your tyres. Check the tyre pressure, including that of the spare wheel, at least once a month and also before setting off on a long journey. 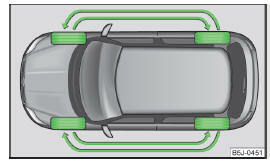 The tyre pressures for tyres are shown on the inside of the fuel filler flap » Fig. 133 – B. The tyre pressure should be at the highest pressure specified for your vehicle at all times. Always check the inflation pressure when the tyres are cold. Do not reduce the higher pressure of warm tyres. Adjust the tyre pressure accordingly if you are carrying a greater load. Fast cornering, sharp acceleration and braking increase the wear of your tyres. The wheels of a new vehicle are balanced. There are a wide range of influences when the car is being driven which may result in an imbalance. This may become apparent by “vibration” in the steering. Have the wheels rebalanced after replacing the tyres. Incorrect wheel alignment at the front or rear leads to excess wear on the tyres. Drive over kerbs and other such obstacles slowly and at right angles wherever possible in order to avoid damage to tyres and wheel trims. We recommend checking your tyres and wheel rims for damage (punctures, cuts, splits and bulges, etc.) on a regular basis. Remove foreign bodies (e.g. small stones) from the tyre profile immediately. If significantly greater wear is present on the front tyres, we recommend swapping the front wheels with the rear wheels as shown in the diagram » Fig. 134. You will then obtain approximately the same life for all the tyres. We recommend that you swap the tyres around every 10,000 km in order to achieve even wear on all tyres and to obtain optimal tyre life. Mark the tyres as you remove them so that you are able to refit them to run in the same direction. Always store wheels or tyres in a cool, dry and, where possible, dark place. Tyres which are not fixed to a wheel trim should be stored upright. The base of the tread of the tyres has 1.6 mm high wear indicators installed. These wear indicators are arranged evenly spaced around the circumference of the tyre a number of times depending on the make » Fig. 133 - A. Markings on the walls of the tyres through the letters “TWI”, triangular symbols or other symbols identify the position of the wear indicators. Tyres age losing their original characteristics, even if they are not used. Therefore, we recommend that you do not use summer or winter tyres that are older than 6 years or 4 years respectively.